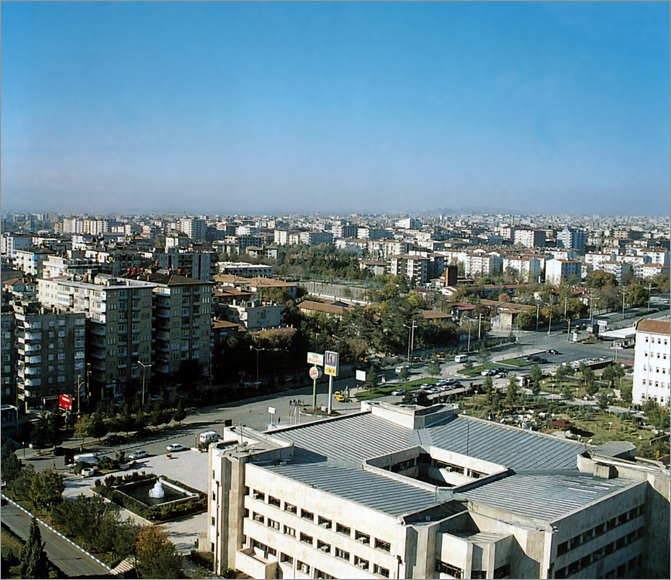 Diyarbakir is the second largest city after Gaziantep in the Southeastern Anatolia Region. 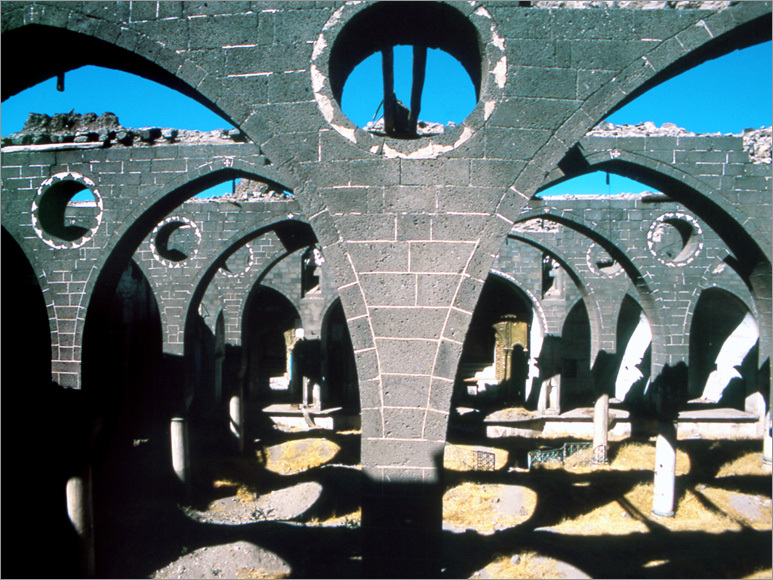 Diyarbakir, whose historical name is Amida, is located on a plateau by the bank of river Dicle. It is composed of two areas, one is Eski Kent (Old City) and the other is Yeni Kent (New City). Yeni Kent, planned to be situated outside of ramparts in the republican era, has an appearance of a modern city with its avenues, separate houses, parks, official buildings and big hotels and shows a contrast with Eski Kent. Early Diyarbakir was surrounded by rampants. The rampants took their first shapes in the midst of the fourth century during Roman period. It is stated that the surrounding of the city was encircled with rampants during the reign of Constantine II, a Roman emperor and the castle of the city was fortified. Rampants have gone under many renovations throughout history. The rampant walls encompassing old residences of Diyarbakir are made of 3-layered black basalt stones. The castle Diyarbakir, surrounded by rampants with 18 bastions, is composed of two main departments, one is interior castle and the other is the outer castle. The length of rampants of outer castle exceeds 5 km. The interior castle surrounded by a separate rampant wall is on the northeastern corner of the outer castle connecting to the outside with Harput Gate (Mountain Gate [Dag Kapisi]) on the north, Urfa Gate on the west, Mardin Gate on the south and Yeni Gate on the east. There are four Gates called Fetih Gate, Saray Gate, Küpeli Gate and Ogrun Gate in this part. Ruins of Artuklu palace thought to belong to XIII century was discovered as a result of excavations made in 1961-1962 in the interior castle side. City rampants are of great importance in terms of giving information of defense architecture of the middle ages besides carrying the characteristics of being one of the longest rampants of the world with its inscriptions and relief works. Diyarbakir Great Mosque built for Great Seljuk Sultan Melikshah in 1091 is one of the primary religious constructions advised to be seen in the city. In terms of its plan, the mosque seems as if it imitates the Emevi Mosque in Damascus but an interesting architectural style is realized by using Byzantium building materials and pillars derivinf from Roman theatre scenes in the construction of the mosque. The mosque also stands out with its architectural elements such as adorns, mihrap (niche in a mosque wall indicating the direction of Mecca), sadirvan (ablution fountain) and minarets. Diyarbakir is of great importance due to Great Mosque, Mesudiye College located next to the yard of the mosque and the construction of which finished in 1224 on the north direction and another mosque construction built for Safis (members of the Safi sect) next to the yard again on the north direction. The Mesudiye College, in the category of colleges with yards and porches of the Artuklu period, was built as two folded made of hewn stones. The mihrap was made of local black basalt stones and it is one of the most fascinating examples of stonework in that period. Zinciriye College among colleges of Diyarbakir, dating back to 1198 is also of great importance as an Artuklu work with yards and porches. 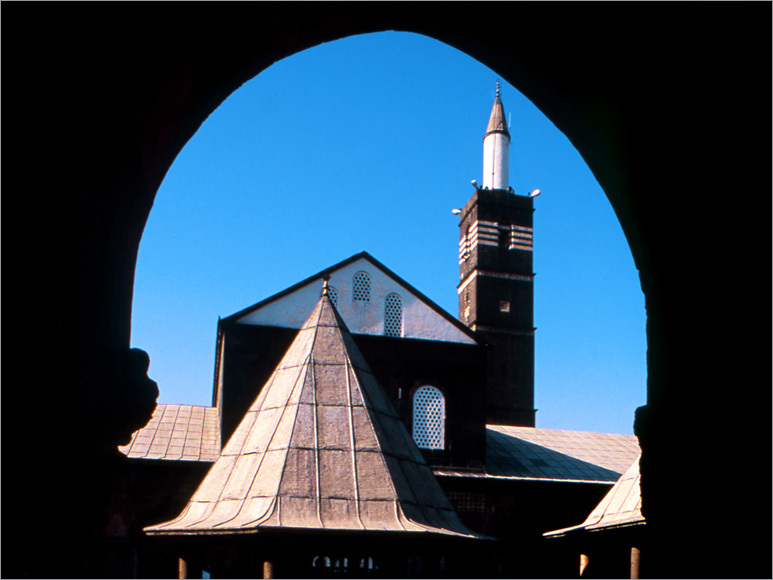 Great Mosque (Meyyafarkin) in Silvan, a town of Diyarbakir, is also an Artuklu work finished in 1157. Kale (Hazreti Suleyman/Nasiriyye) Mosque dating back to the tribe Inalogullari period, Ayni Minare Mosque, Seyh Matar Mosque, Nebi Mosque and Safa (Iparli) Mosque built during Akkoyunlu period are religious constructions worth seeing in Diyarbakir. While especially the minaret of Nebi Mosque reflects typical features of the Ottoman architecture, Safa Mosque bears the marks of Persian (Iran) architecture with its minaret embellished with mosaics. A great number of architectural works were constructed during Ottoman period in Diyarbakir. 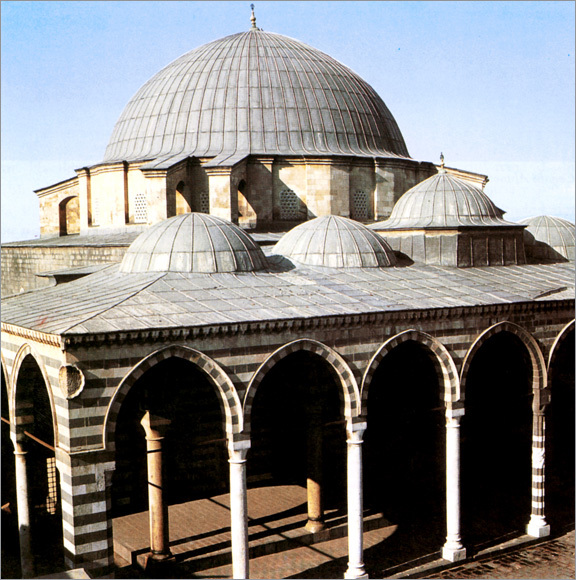 It is important that Fatih Pasha Mosque constructed in 1520 is the first Ottoman mosque of the city. Iskender Pasha Mosque and Behram Pasha Mosque built in the last years of the reign of Suleyman the Magnicient and Melek Ahmet Pasha Mosque built during the reign of the Sultan Selim II are among works worth touring an seeing in terms of reflecting the most beautiful examples of Ottoman architecture and adornment art. Another kind of religious constructions advised to be toured in Diyarbakir is churches. Meryem Ana (the Virgin Mary) Suryani Kadim, Keldani, Surp Gregos, Surp Sarkis (Celtik Church), Saint George (Kara Papaz Church), Catholic and Protestant Churches are among these churches. But today only Meryem Ana Suryani Kadim Church is active. If you want to tour the museums in Diyarbakir, you can start from Ataturk House used as a museum today nearby the river outside of city walls. 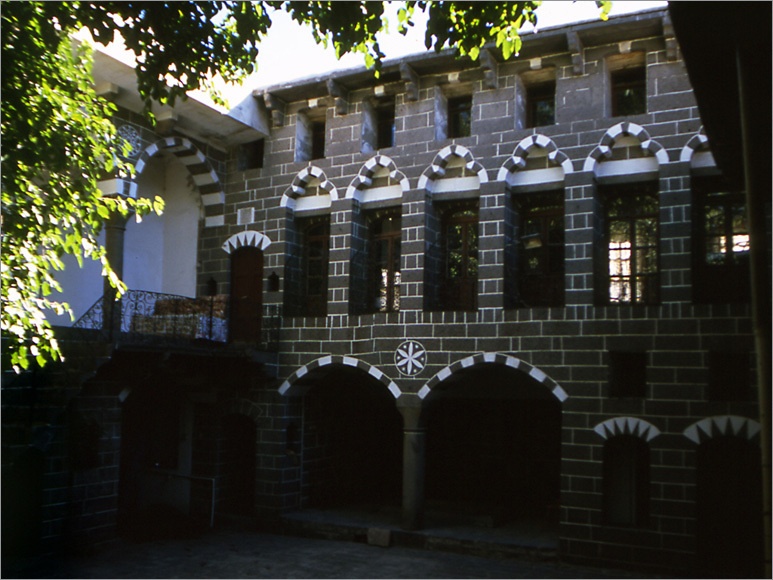 The mansion where the author Cahit Sitki Tarancı was born and which is an example of the local architecture in the region is converted to a museum in 1973 besides Diyarbakir Museum. 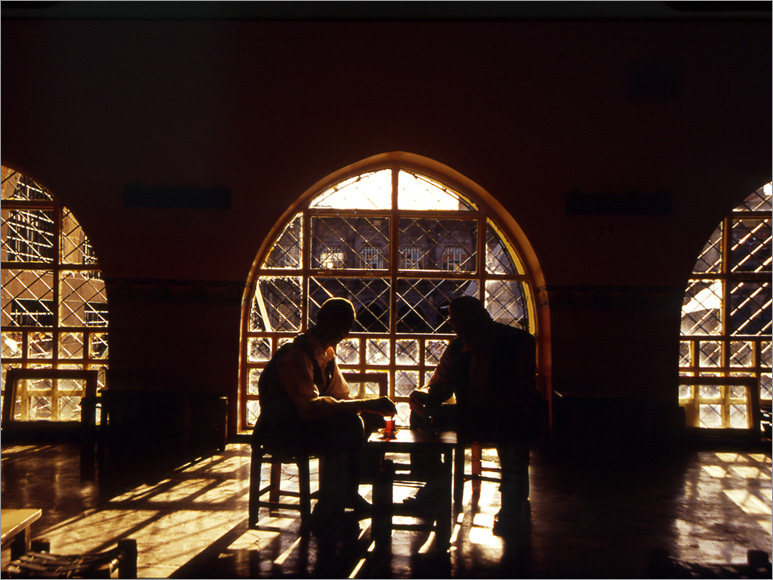 In the museum, ethnographic materials arousing Diyarbakir life in XIX century and private stuff, photos and documents of the author are exhibited. 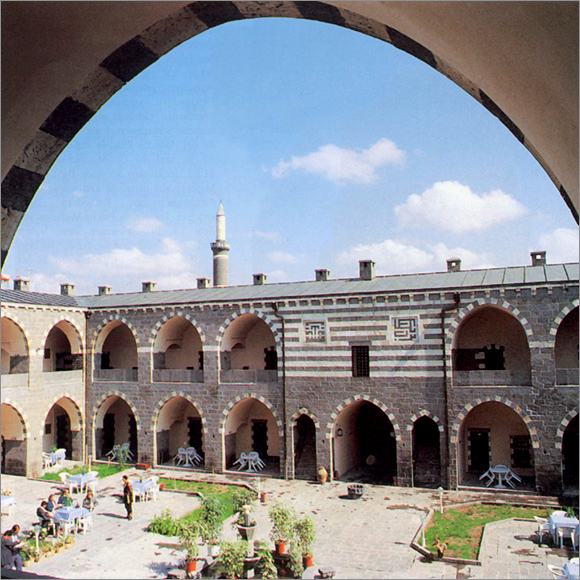 Diyarbakir is a province important in terms of its inn constructions. 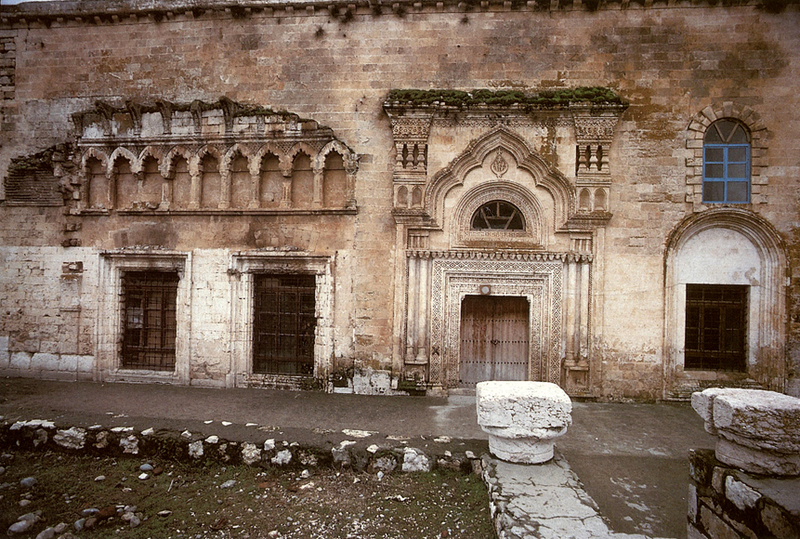 Deliller Inn, Hasan Pasha Inn, Cifte Inn and Yeni Inn are among these constructions. Deliller Inn (1527), in the area where Mardin Gate of the rampants of the outer castle is located and which used to be a caravanserai, serves as a hotel today. Deliller Inn is named like this by the folk as delils (guides) who will accompany the pilgrim candidates gathering here in order to go to Hicaz from Islamic countries stay here. Malabadi Bridge is a magnificent Artuklu work on the Diyarbakir-Batman highway, on the right of the highway recently been constructed, built in 1147 during Artuklu period on the Batman Brook. 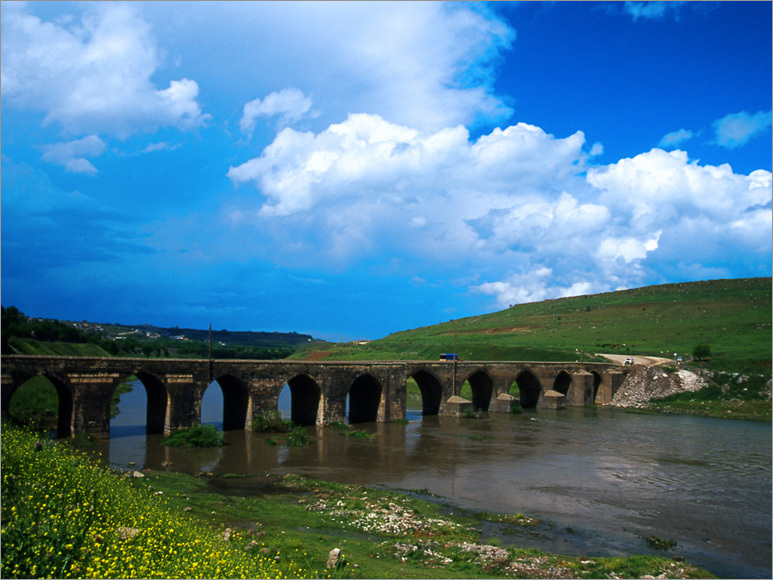 This bridge is the bridge whose arch is the widest among bridges with stone arches in Anatolia. There are two sheltering rooms built for the caravans and passengers on both sides of the arch. It is possible to perfectly view rivers and city walls on this bridge. Today, Malabadi Bridge is not used as transportation is fulfilled via a new bridge. Cayonu Oren (Ruins of a Building) Ground in the borders of the village Sesveren Pinari in the town Ergani in the province Diyarbakir and Uctepe Oren Ground in the village Uctepe in the town Bismil are among places recommended to be toured as they are one of the oldest residences in Anatolia. 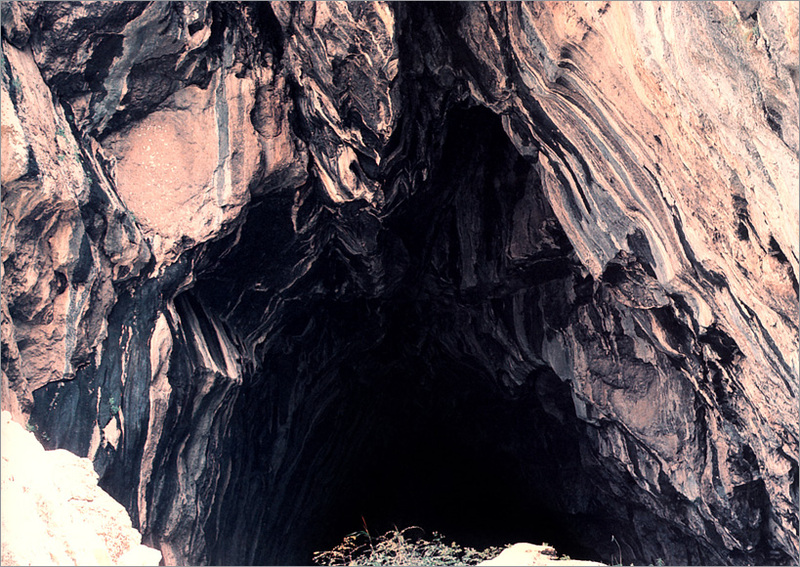 Moreover, Hassuni Caves and Mount Zukifil are also places worth seeing. And Cermik Thermal Tourism Center serves as a thermal spring. Among traditional handicrafts of Diyarbakir, jewelry, silk industry, copper workings are of great importance. Clogs and drawers made of silver, coriander necklaces and straw bracelets are examples of Diyarbakir jewelry. 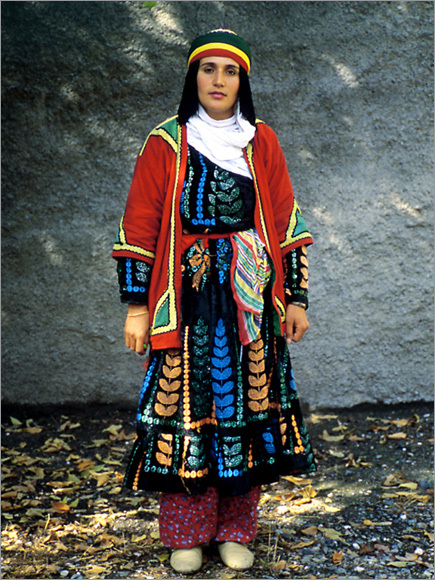 Silk industry carried out in Centrum, Kulp, Silvan and Lice towns and silk cloths, handkerchiefs, loincloths form interesting examples. Pottery, saddlery, making felt, rug, lace, saddlebag industry, embroidered napkin, waist cloth and carpet industry are among other handicrafts of Diyarbakir. 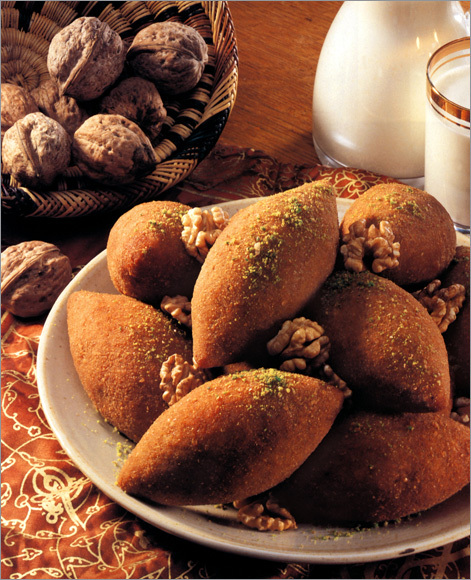 Diyarbakir, known for its gigantic watermelons, is very rich in terms of meal culture. The liver kebab known also as Cartlak kebab is among traditional dishes. Thin sheet of sun-dried fruit pulp made of grapes and sausage, grassy cheese (a kind of cheese having a specific plant inside), braid cheese (a kind of cheese having an appearance of braids) and sumac are the most eaten foods.